When you stay at Yamanokami Onsen Yuukaen in Hanamaki, you'll be in the mountains and within a 5-minute drive of Namari Onsen Ski Resort. Featured amenities include complimentary newspapers in the lobby and an elevator (lift). 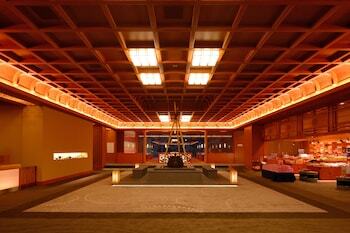 Event facilities at this ryokan consist of conference space and meeting rooms. A train station pick-up service is provided at no charge, and free self parking is available onsite. With a stay at Nagomi No Yado Ookawa in Toyooka (Kinosaki Onsen), you'll be a 4-minute drive from Kinosaki Onsen Ropeway and 8 minutes from Hachigoro's Tojima Wetland. Located in Tokyo (Taito), GA-JYUN Asakusa is within a 10-minute walk of Sensoji Temple and Asakusa Shrine. Featured amenities include luggage storage and laundry facilities. With a stay at HOTEL LiVEMAX Omori Ekimae in Tokyo (Shinagawa), you'll be within a 15-minute drive of Tokyo Tower and Kabuki-za Theatre. The front desk is staffed during limited hours. With a stay at Shinjuku Oscar Inn in Tokyo (Shinjuku), you'll be minutes from Omoide Yokocho and close to Meiji Jingu Shrine. The front desk is staffed during limited hours. Located in Hitachinaka, Hotel Crown Hills Katsuta is within a 15-minute drive of Mito City Water Supply Tower and Mito Castle Ruins. Free self parking is available onsite.